In Russia, at one of the bases of the Federation of glider sport of Russia - Shchekino airfield near Moscow, the first test flight of an unparalleled in the world self-takeoff ultra-light glider (weighing less than 115 kilograms) with two retractable turbojet engines took place. Glider received the designation “Orange demon” by the name of the character of the children's Japanese anime cartoon. Test pilot Igor Volkov not only completed several passes over the airfield, but also one of the aerobatics - the Nesterov loop. The uniqueness of this aircraft is that the mass of the aircraft according to the Russian and international classification does not require a pilot's license and medical examination. From the point of view of aviation regulation, this is a bicycle. All that a pilot needs to fly on this glider is to learn how to fly a two-seater glider with an instructor, as well as observe the rules for using Russian airspace in flights. The wingspan of the glider is only 12.6 meters, the design is collapsible and in winter the glider can be stored in the garage or in the country. 2 turbojet engines designed for use in aircraft models, allow the glider to gain altitude up to 3-4 kilometres with a vertical speed of 8 meters per second. But the main application of these engines is to climb 500 meters in order to turn them off, put them inside the fuselage and continue the soaring flight using ascending currents. In central Russia such a flight can last up to 8 hours. The airframe itself is a carbon-fiber retrofit of a fibreglass analog (the weight was reduced by more than 35 kilograms) of the Russian glider AS-4-115 produced by Aviastroitel OJSC, Penza (designed by Vladimir Fedorov) and capable of performing aerobatics. Jet engines have been put on a glider for a long time - back in the 60s, in the USSR, in the Antonov Design Bureau, there was a project to create a version of the “A-13” jet glider for training military pilots. But nobody in the world has ever attempted to create gliders so light before. The second stage, the developers (Igor Volkov and Alexander Kulishov) are planning to create a 2-seat glider in the same weight category, which could also become an educational glider for the initial training of glider-athletes, which is currently a serious problem, as in Russia from - due to excessive regulatory impact on small sports aircraft, obtaining a pilot license for a glider has not been possible for more than 3 years. And even the well-known traveler Fedor Konyukhov, who is going to make a world-round flight on a glider with electric motors, had to go abroad to get a certificate. Pilots are also planning to test the glider at competitions at the Usman aerodrome in Voronezh, and then test it in mountain flights in the Caucasus (Kislovodsk, Vladikavkaz), during which the engine is no longer a luxury but a necessity, since there is simply no place for landing in the mountains. 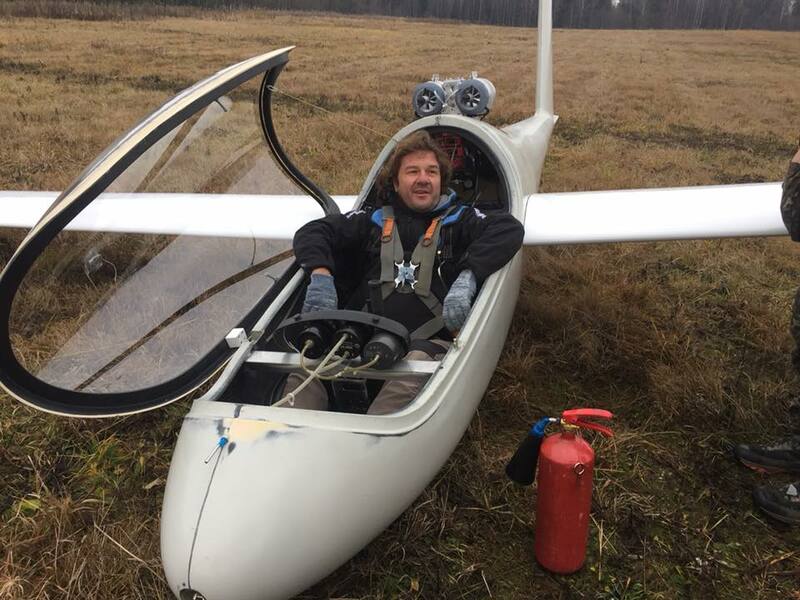 The pilot-designer, Alexander Kulishov: “For the first prototype, I considered strength with a margin, which makes it possible in the future to even ease the glider and “wipe”on a 2-seat training device. This project had several goals: to work on the engineering task for the soul, to make an interesting glider, to help the only company in Russia that builds a glider and to involve young pilots in glider sport”.